As if you needed another reason to attend Lime Rock Park’s Historic Festival 32 over Labor Day weekend, Murray Smith, chairman of the event, has confirmed which cars from Ralph Lauren’s private collection will be displayed over the four-day Labor Day weekend that comprises historic and vintage racing competition surrounding a concours d’elegance. Mr. Lauren’s private collection is spectacular – and it is a very rare event when cars of his are made available to the public at large. Ralph Lauren’ first car was a Morgan. This perfect example of a Morgan Flat Rad (radiator) is one of just 750 built and was purchased by Lauren in 1986. The Ferrari 250 LM was introduced at the Paris Auto Show in October, 1963 to great fanfare. In the LM, Pinninfarina presented a great case-study in how form following function can be beautiful. Unable to obtain the necessary homologation for GT racing, the 250 LM raced in the prototype category; a 250LM won Le Mans in 1965. Between 1965 and 1968, chassis 6321 – 31 of 32 built – was campaigned extensively and successfully in 19 Australian racing events, winning 13. Among those victories was the Surfers Paradise 12 hours in 1966, co-driven by Andy Buchanan and a young driver just beginning a brilliant career… Jackie Stewart. The concept of the 4½ Liter, supercharged Bentleys (The Blower Cars) originated with Sir Henry “Tim” Birkin, privileged son of a wealthy family whose resources allowed him to pursue his ambition of becoming a race car driver. Birkin developed a friendship with W.O. Bentley and given Birkin’s connections, Bentley realized that Birkin could help the struggling car maker (which was going bankrupt) to win important races. Birkin knew he would need a lot of power to compete with the supercharged Mercedes, Alfa and Bugatti racing cars of the time and came up with the idea of supercharging the then-fastest 4½ Liter Bentleys. Bentley, though skeptical, conceded and built 50 supercharged cars to qualify for the 1929 Le Mans 24 Hour race. Birkin built two “works cars,” but neither finished. (A “Speed Six” Bentley placed first, followed by 4½ Liter, non-supercharged Bentleys placing second, third and fourth.) With his money running low, Birkin convinced friend, noted socialite and horsewoman Dorothy Paget to help finance his team. Entering Le Mans again in 1930 with two Bentleys (#8 and #9) including chassis HR3976, which carries the Paget crest between the radiator cap and the Bentley badge, the Birkin cars did very well – while they lasted (the fastest race-lap, 6 minutes 48 seconds, was set by the 9 car). Birkin’s cars again failed to finish; HR3976, driven by Dr. Dudley Benjafield and Giulio Ramponi, completed 144 laps before it broke a piston. This car’s best finish was a second at the 1930 French Grand Prix (Pau) at the hands of Birkin. By the end of 1930 Paget’s patience with the Birkin team ran out; she cut off funding and the team closed up shop. HR 3976 was then sold to a Frenchman, racing at Le Mans in 1932 and 1933, again failing to finish either. This car was restored in 1990 by Traction Seabert of England with care given to not over-restore it but rather to maintain it in its “as raced” condition. 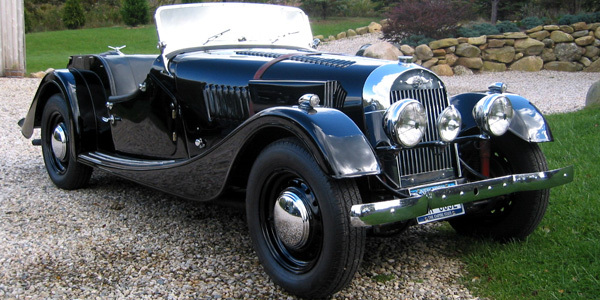 It is one of only two “short chassis” (9’ 9 ½“) Bentleys built. When it comes to performance, the Jaguar XKSS was in a league of its own, likely the world’s quickest and fastest production car in 1957. The XKSS was a road-going version of Jaguar’s incredibly successful D-Type race car; factory run D-Types won Le Mans in 1955, 1956 and 1957 while privateer D-Types won many other races, too. Jaguar was convinced by Briggs Cunningham that it could win in American SCCA production car racing, where the rules required 50 street-legal cars be built. So Jaguar changed the model number of 25 XKDs to XKSS, with 25 more to be built to meet the minimum 50. Turn signals, a larger windshield, bumpers and the like were installed. Unchanged from the competition D-Type was the engine (the 250-bhp dry-sump 3.4-liter straight-6), the rack-and-pinion steering and disc brakes. As the conversion work began on the first 25 XKDs, a fire at the Brown’s Lane factory in February 1957 destroyed nine of the cars – and all of the tooling. The 16 surviving XKSS were converted and delivered. Later, two original D-Types were returned to Jaguar and converted to XKSS specifications. One of those, XKD533, is the Ralph Lauren car, changed to an XKSS at the factory in 1958 for Pierre Chemin of France. Porsche’s first outright victory in a manufacturer’s championship came in the 1959 Targa Florio, as the new RSK led three other Porsches across the finish line for a clean sweep. This car, 718-009, was used for practice in that event and was sent into battle for the remainder of the season. The most significant race for 718-009 was the Tourist Trophy on the Goodwood Circuit in England on September 5, 1959. Porsche lay third in the points with 15 against Ferrari’s 18 and Aston Martin’s 16. Victory for any of the three would bring the crown. The drivers of 718-009 were Count Joakim “Jo” Bonnier and Wolfgang von Trips. Holding off the 3-litre Aston Martin driven by Stirling Moss proved an impossible challenge, but 718-009 headed Tony Brooks’ Ferrari – boasting an engine twice the size of the Porsche – into the last of the race’s six hours. Von Tripps broke the class-B sports car lap record four times, running 92.9 mph on the penultimate lap, and finished in second place, two seconds ahead of Brooks in the Ferrari; Aston Martin took the championship.